Home > De-Stressing > Gardening - A Stress Reliever? Many people rarely take time out of their busy day to day activities for something fun, something that will make them smile, and something they truly enjoy. Most of us are so busy worrying about work, deciding what to cook for dinner, or trying to keep the kids from fighting, a hobby is often the last thing on our minds. But, you need that stress relief. 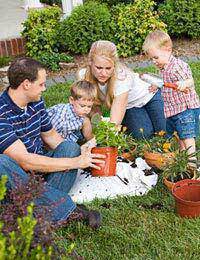 Hobbies, such as gardening, can be a great way to apply stress management while still having a good time. When you are gardening, it takes you back to the basics of life. After a day of dealing with congested traffic, ringing cell phones, and working on a computer, getting your hands dirty in soil can give you a connection to nature. It reminds you that our food comes from the Earth and how gardening may seem simple, but without it, life would cease to exist. It gives you time alone to work with the plants without the noise interruptions such as the television, your children, or the family animals. You can use the time to reflect on what is truly important in life. Doing something as rustic as gardening may also make you more appreciative of the modern luxuries that we have at our disposal today. Gardening also allows you to do something most people don’t do anymore – grow your own food. There is a sense of independence and pride that is gained from growing your own food, even if it is something as simple as tomatoes or peppers. Even though it requires time to plant the seeds, weed the area, and water so the plants can grow, once you see the results of your work, you may find yourself pleasantly surprised. Even if you don’t choose to grow vegetables, but flowers, you will appreciate the beauty and colour of the flowers you have grown yourself. Plus, growing your own flowers is much cheaper than buying them and you have the satisfaction of knowing that you grew them yourself. Scientists have known for a while now that lack of sunlight can be detrimental to our mental health. Lack of sunlight can make you sleep too much, feel lifeless, crave bad foods such as sweet and starchy items, and even make you feel depressed. Getting out and tending to the plants in your garden will help you get more of the much needed sunlight, which will also provide you with vitamin D.
Gardening can make you feel more spiritually connected to the Earth, but it can also help you physically as well. When you garden, you will need to dig in the dirt, plant the seeds, then prune and harvest the plants. These activities help you build muscle, help you become more flexible, and it even helps strengthen your lungs and heart. Gardening is a great way to relieve stress while still actually getting exercise at the same time. Remember to stretch before and after gardening. While it may not seem like a workout, chances are you may bend and move in ways that you aren’t used to and you don’t want to pull muscles or get so sore you don’t feel like gardening the next time. Take breaks as needed and if you are out in the sunshine, remember to stay hydrated. One thing you want to be careful of when gardening to relieve stress is that you don’t create additional stress. Keep it simple at first to help your stress management and don’t bite off more than you can chew. Be committed to seeing your garden all the way through. You can even start out with what is known as a micro-garden. This requires planting in pots rather than actually digging in to the ground. Make sure you have time to garden and start out slowly. Grow things that you enjoy, whether it is flowers, herbs, or vegetables. As with any hobby that takes you away from the rat race of daily life, gardening and growing plants can help provide stress relief, improve your health, and even give you a new outlook on life.